My thougts about Rwanda and Africa today and tomorrow. I have seen so many reactions from different people about the response that President Macron gave on the best way to develop the continent of Africa at a G20 summit in Hamburg, Germany. If you have not seen it, I encourage you to watch it, especially if you are African or care about international development in Africa in general. Many Africans accused President Macron of being racist, sexist, and patronizing when he answered the journalist question about what would the Marshall Plan for Africa look like and what role France would play in that. Below is my 2-cents about what I learned from his response and a detailed analysis of all the ideas outlined. Idea 1. To develop Africa, you need more than a “Marshall Plan”. Political instability and unstable governments. Lack of cooperation among countries with regards to illegal trafficking of people, leading to mass migration, drugs, and illegal arms included. For the Marshall Plan to work, you need to ensure durable peace and security first. Marshall Plan will not and cannot work for African countries if the above issues are not resolved or reduced to a minimum first. After World War II, Europe was devasted and received the equivalent of about 150 Billion dollars from the United States (adjusted for inflation in today’s dollars) for reconstruction. This plan jump-started the European economy and after a few decades, the European Union and other European countries were back on their feet as a major economic bloc and trade partner of the United States. Macron points out that throwing money at Africa has never worked and he strongly disagrees with this model that has been used for over 60-years. According to World Economic Forum, Africa has received around 1-Trillion dollars in aid and has done a little to lift African countries out of poverty. Clearly, doing this over again would be a huge mistake. It with will never work. President Macron acknowledges that peace and development should go together and African countries a shared responsibility to ensure the safety of their population. He points that a few countries who have maintained peace and security have marked outstanding economic growth, which shows opportunities for other countries. 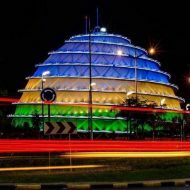 Rwanda and Botswana are good examples. Before becoming President of France, President Macron was an investment banker. What do investment bankers do? They are trained to invest their capital for a profit. Before investing their funds, they have to do a detailed financial risk assessment and hope for a good return on their investment. Unfortunately, the 1-Trillion dollar capital invested on the African continent did not yield much return, and as a good investment banker, he is looking change frauds before investing more of his nation’s capital. Can you really blame him? In my humble opinion, no! If you were an investment banker and had invested a Trillion dollar capital in Africa and had returned as little or no profit as the aid package given to Africa in 50 years, you would have to be the worst investor in the whole world. In the end, you would not only get fired but also, you would be lucky not to go to jail. Overall, President Macron gave out the pure harsh truth that many agencies in the international development arena choose to ignore. However, for us Africans, we already know these issues. We deal with them in our daily routines: corruption, insecurity, you name it. It seems to me that many of my African brothers and sisters seem to be irritated by the rhetoric of President Macron. His “tone” and a few of his “word choice” were simply arrogant. You can sense the complex of superiority that France usually expresses on its former colonies. However, as much as I hate to say it, the underlying message is sadly true. He literally dropped the mic in our faces. What frustrates me, even more, is that we have allowed these countries to talk to us like a parent talking to his/her kids. We have become way too dependent on them, both financially and politically. We better get our acts together before it is too late. How many times do you see African leaders running to France to discuss a peace deal after a presidential election in a lot of former French colonies? We have seen examples in Ivory Coast in 2010, the Republic of Central Africa in 2012, Burkina Faso in 2015, and the list goes on. What message do we send when our African leaders cannot sit together to discuss our own issues but have to run to Paris to plead their cases in front of their master (France)? It is shameful and we have played a big role in feeding their superiority complex. Look at the mass migration that Europe has to deal with because of our African brothers and sisters blindly running to Europe hoping for that “magic” better life? These are the issues, we Africans, should be trying to solve, not relying on the Europeans, ( who have their own issues themselves), “to save us”. Although I can understand the frustration of many people about a few sentences such as African problems are “civilizational”, whatever that means, or the “7-children per woman statement”, which is untrue and exaggerated in all honesty. I think the overall response is mostly correct and I wish that our leaders would strive to change our continent situation so that NOBODY CAN TAKE IT TO THE STAGE TO HUMILIATE AND LECTURE US ON SOLVING OUR OWN ISSUES. Honestly, it makes me sick and I am tired of it. Thank you! Much appreciated, bro! Didier Champion, Blog at WordPress.com.